How you can develop your analytical thinking skills. You’ll also learn how to nail them on your resume and in a job interview. How to define analytical skills. Why employers value analytical skills and how they test them. What you can do to show your analytical thinking skills on your resume. It’s almost impossible not to find a job offer where analytical skills aren’t listed among the employer’s requirements. The question is: what do analytical skills mean? Are analytical thinking skills the same as research skills, or problem-solving skills? Analytical skills are the skills of collecting data and performing analyses of all sorts, and reach conclusions. Notice the plural form here. We’re talking about skills, not a single skill. It’s because your ability to analyze will usually require you to perform at least a couple of correlated actions. Analytical skills allow you to collect, organize, visualize, assimilate, find patterns, draw logical conclusions, and find solutions to various issues on the basis of information and data around you. It would be a bit of an understatement to say that analytical skills are the same as problem-solving skills. Thanks to your analytical skills you might just as well prepare a highly accurate sales forecast, which on its own isn’t a solution to any problem. Analytical skills are welcome by employers from a wide variety of industries. In fact, the list could go on and on. Thanks to new business models and rapid technological development, there appear more and more jobs where analytical skills are more than welcome. Think of SEO, CRO, UI/UX, or product development positions in SaaS companies. At this point, you may feel like you can more or less define analytical skills. But what do analytical skills mean in practice? Say, one of your website’s landing pages has been underperforming in terms of sales. You’ve been tasked with identifying the problem and proposing a solution. First, you might want to decide what data you’ll be looking at to make initial assumptions. How did the page perform historically in relation to other landing pages? Was there a moment in time when something changed? What does the structure of the page look like? What keywords is it centered around? What anchors are used to link to it? Once you collect the relevant data, you might want to start putting it together to look for patterns and anomalies, theorize, prepare an action plan, and communicate it to your team leader. If you have analytical skills, these are the things that might be expected of you at work. Develop solutions with the use of statistical analysis, simulations or predictive modeling. Devise and evaluate methods for collecting data (e.g. surveys, questionnaires, or opinion polls). Review budget proposals for completeness, accuracy, and compliance with laws and other regulations. Conduct simplification and measurement studies to devise efficient and effective ways of operating. Select hardware and software to ensure stable and efficient support of the network. Even though all these tasks come from various industries, they all require strong analytical skills to succeed. It’s not just about researching any data. You need to be able to identify what data is relevant and what is just random noise. Making sense of data is one thing, it’s equally important to be able to put your point across in a convincing manner. Sometimes it all boils down to looking at pros and cons of available solutions and putting them in a larger context. At the end of the day, it doesn’t matter if you’re working with a data set or gain understanding through trial-and-error. Logical thinking is the basis of your success. Even though your analytical skills can serve other purposes than problem-solving. Most of the time this will be the most practical application of them. The choices you make must be understandable to your co-workers. No employer will take your word for it. These could be taken online or at the company location. Depending on the company and the position you’re applying for these could consist of numeracy questions, literacy questions, tasks where you need to put events in a logical series or look for inconsistencies. The tasks might involve training sessions which teach you some skills, which you’ll need to be able to use in practice to solve a problem. You may be asked to work in groups with other participants on case studies. The recruiter might want to learn about specific situations where you had to use your analytical skills in practice. More on this below. They will test you. One way or another. We’re talking about skills. Not talents. And skills you can learn. Yes, you got it right. To teach someone effectively, you need more than just a good grasp of the subject matter. You must be able to explain it in a clear way, see it from different perspectives, understand the challenges it poses, find patterns, analogies, rules, and exceptions. Teaching others will help you hone your analytical skills and see the world through other people’s eyes. As simple as that. Practice makes perfect. There are a lot of resources available online both paid and free that can help you develop analytical and critical thinking skills. Have a go at a couple of tests to see what’s expected of you. You can start with this one, or this one. Become more observant of the world around you. Ask questions, consider alternatives, don't take things for granted. No ideas on how to begin? Here's a fun one: when watching your favorite Netflix series look for plot holes and inconsistencies, talk to your friends about them, say what you'd have done differently in the protagonist’s place. It’s a simple and enjoyable way of improving analytical skills. Chess. Sudoku. Einstein’s Riddle. Rubik’s Cube. XCOM2. You name it! Improving your analytical thinking skills doesn’t have to be boring. 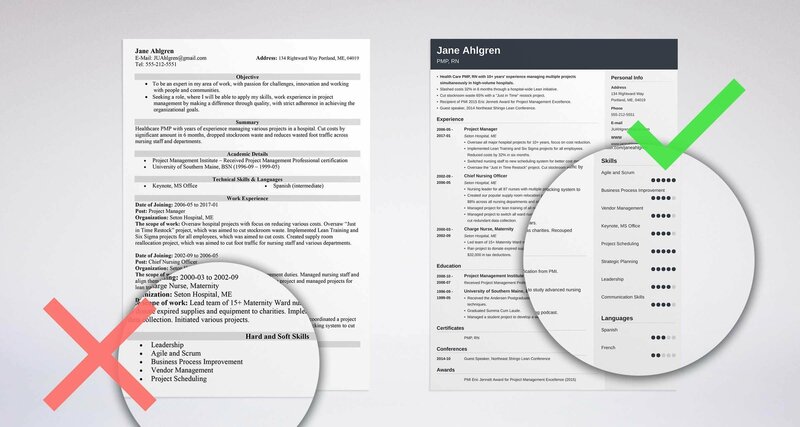 If you want to impress your future employer with your analytical skills, there’s no better way of demonstrating them than on a carefully crafted resume. You can approach making your resume in a truly analytical manner. Tailored to a specific job offer. The same is true about the best skills for a resume. They need to be tailored to a specific job. You already know that there’s no single analytical skill, but a set of skills. To convince the employer you’re the best candidate, you must show them you’ve got specifically what they’re looking for. Identify the keywords and use them on your resume. Develop and maintain sales reports to provide actionable insights that support data-driven decision-making for the sales and executive leadership teams. Now, you can put these particular skills straight into your key skills section. Your best bet is to go through the entire job posting and identify all the analytical skills sought after by the employer. This way you’ll avoid overgeneralizing (e.g. putting analytical skills in your resume key skills section), and listing wrong skills (e.g. diagnostic skills) which are in fact among analytical skills, but not necessary for the role. As you see, you don’t need any lists of analytical skills. What you do need, though, is to know what analytical skills to list on a resume. Pro Tip: Putting the right keywords on a resume will not just help you nail the analytical skills in your key skills section, but also guarantee you getting past the ATS scanning stage. Put analytical skills as accomplishments on your resume. Apart from listing the right analytical skills on your resume, you can actually demonstrate how proficient and effective you really are. Developed and maintained sales analytics reports and dashboards that identified and effectively helped to eliminate major bottleneck generating 20% loss of revenue. This way you’re not just listing a relevant analytical skill on a resume, but you’re giving a real-life example of how good you are at doing it. To up your chances, do both: fish out the relevant analytical skills and list them among your key skills and describe your best analytical skills in terms of achievements. Get ready for the job interview. You can prepare for an interview “in general.” For example by giving yourself a pep talk in front of the mirror. The recruiter will want you to prove to them your resume is not a work of fiction, and your analytical skills are up to par. You already know how to identify the analytical skills the employer looks for by looking for keywords in a job posting. You know how to use these keywords to your advantage by including the relevant analytical skills in your key skills list and by describing your skills in terms of achievements. Now you need to learn how to talk about these skills using the so-called STAR method. By the way, we have a great guide on STAR method interview questions that will help you ace any interview. Here’s what you can expect in an interview. The recruiter is particularly interested in your data and metrics interpreting skills as well as your reporting skills. The question itself may be a bit misleading as the term analytical skills is broad. From the job offer you’ve learned which skills you need to focus on. And more than that, you’ve listed an achievement you can now elaborate on in more detail. So, how to ace such a question? Situation: The employer wanted to develop analyses and reports to boost sales. Task: You were tasked with devising and implementing the reports and dashboards. Action: What steps you took to perform the task. What methods and technologies you used. Result: What was the result of your actions. And this is how you can prepare your answers to analytical skills interview questions. There's no single definition of analytical skills. Analytical skills consist of a set of skills that includes problem-solving, data skills, and creativity among others. There are a large number of jobs requiring analytical skills. Employers value analytical skills for their versatility and transferability. There are many analytical skills tests and interview questions to test analytical skills. The good thing is there are many ways to improve analytical skills. When looking for a job it’s crucial to identify what analytical skills the employer is after. Your resume needs to be tailored to put the right analytical skills in the spotlight. When preparing for a job interview, focus on the analytical skills you listed on your resume and learn how to talk about them using the STAR method. Do you have any questions about analytical skills? Maybe you’d like to share some tips on how to develop them? Give us a shout out in the comments below! We’d love to hear from you!